The stock market gets all the love. Usually, when we think of investing, we think of that. But the global bond market is even bigger than the global stock market in size - $100 trillion to $85 trillion respectively. Bonds - or fixed income, if you will - play an important role in your investments, even if your portfolio is all-stock, and it’s important to understand how they work. You might have heard something like this: “bond prices and yields have an inverse relationship” or “as interest rates go up, bond prices go down”. What does that mean? Think of a bond as a loan. You are lending someone (a company, a municipality, the US government, etc) some money with the agreement that they will pay you an agreed-upon interest rate and then return your original investment to you on a particular date. The prevailing risk-free rate is usually understood to mean the 3-month US Treasury bill: it’s as close a proxy as we’ve got to represent your alternative choice if you wanted to be pretty much assured you won’t lose your money. As you recall from last year’s post about risk, risk-free means free of default risk - the US government can always just print more money, so you are guaranteed to get your initial investment back. But the rest of the risks (reinvestment, inflation, interest rate) are negligible for such a short amount of time, so that’s why we call it a proxy for the risk-free rate. There will be a prevailing interest rate for other things like different maturity government instruments, a 30-year fixed-rate mortgage, or 4-year auto loan: you can see various examples and how they change over time here. From there, the interest rate on a bond offered by a company or a local government will increase depending on the next three bullet points. When the bond is initially offered, it will be at par value (usually $1,000 per bond) and have a stated interest, or coupon rate. That rate needs to be set at a number that will make it attractive to investors (everyone wants to earn a bigger stream of income) but remember that the borrowing organization needs to make the payments, so it can’t be too high or the borrower will have trouble meeting the obligation. That’s why it’s important for borrowers to understand the rest of the market and how attractive their offering will be. Once the bond is initially offered (it’s usually just large institutional investors buying at this point), the borrower gets the money to fund their operations or grow. Let’s take an example of one ten-year bond of $1,000, with a coupon rate of 5%. Every year, the bond will pay $50 (5% of $1,000), and after 10 years the $1,000 is returned. The YIELD - the amount the bond actually returns on the initial investment - is also 5% at this point. The buyer and seller effectively agreed that 5% every year was an adequate amount to for the seller to compensate the buyer for the use of that $1,000 for 10 years, and the extra risk the buyer was taking on that the seller would default, their money would be worth less in 10 years due to inflation, and that interest rates would change in that time. Then the bond is traded in the secondary market. Here is where things start to change. The coupon rate stated on the bond stays the same, however. If a bond is offered at 5%, it will continue to pay 5% of the par value. But the world doesn’t stand still, and as market conditions - mainly, the prevailing interest rate and the creditworthiness of the borrower - change, the bond price will change in reaction. In other words, the bondholder who is looking to trade the bond has to assess market conditions and how they’ve changed, and re-price the bond accordingly. Let’s say it’s a year later, and the risk-free rate has increased by an entire percentage point, and the bond issuer - the company or organization paying the coupon - has had some negative press lately due to mismanagement. They would not be able to issue the same bond, now with a 9-year term, for the same rate. They would need to pay a higher rate to compensate investors for the higher perceived risk of lending them the money, as well as higher interest rates in general. So our bond, if issued today, would have to have a coupon of 7% instead of 5%. So the bondholder, who currently owns the bond, wants to sell to take advantage of the better investment opportunities out there. But no one will buy a bond that is yielding only 5%, because any investor would demand a higher return. Well, you can get this bond to yield a higher return too, you just have to drop the price until you achieve the yield you want. To get the yield to maturity (the total return if you hold the bond for the remaining 9 year term) to be the 7% that the market is requiring right now, you would have to sell it at $861.15 to make it attractive to investors - who, remember, can simply buy any bond on the market that fits their required yield. Note that these numbers are pretty exaggerated to illustrate the effects of a change - typically the moves won’t be so large. And this works the opposite way too: if prevailing interest rates fall, and/or if the borrower’s fortunes have improved and they are seen as a safer bet, one of their bonds with a relatively high interest rate will become more valuable in the market and the bondholder can get more for their bond when they sell. So this is why bond price and yield work inversely. The concept applies outside of the bond market as well (and in fact, most stocks themselves have yield, in the form of dividends - it works the same way). You can apply the principles to your own finances and what your own mortgage and loans are costing you, and even beyond your finances. Think of a garden: the amount of vegetables produced is the yield, regardless of how many seeds you plant or money you spend up front. Of course, everyone wants to maximize that yield while minimizing the input required. This isn’t so different. And even if you don’t own bonds in your portfolio, this affects you - the companies whose stock you own will have to pay more or less in interest depending on how the rates change as they look to borrow more. This is why the stock market often declines when the Fed raises interest rates: because of the expectation that it will cost companies more to borrow to fund growth, and that will either cut into profits or negatively affect long-term growth potential. Risk is a funny word. It's one of those things that can mean anything you want it to. At its most basic, you can think of it as the possibility that something unwanted will happen. The term has a negative connotation, but it's also what drives returns - the reason the stock market is a source of growth for investors is because you are compensated for the possibility of losing money. When it comes to your financial life, discussions of risk revolve around trying to predict what your reaction will be if an investment you own, or your entire portfolio, loses a lot of money really quickly. What would you do? Would you sell everything to stop the bleeding? Ignore it and wait out the volatility? Buy more of the investments you already own? The thing is that portfolios, and certainly individual stocks and bonds, will undoubtedly lose value at some point. That's why we 1) diversify and 2) invest for the long term. I talk everyone's ear off about the specific reasons why those are two key aspects underpinning my investment philosophy, so if I haven't talked yours off yet, feel free to avail yourself of the privilege. But this post is about the different kinds of risk to which we're exposed as investors, and it's not as simple as just something losing value. There can be lots of different reasons why and I think it's important to understand them. So here's a rundown. Interest rate risk: the possibility that rates will increase, causing the price of bonds to decline. But you don't own bonds, you say? Maybe. But companies borrow to finance their projects, and if interest rates increase, they have to pay more to do that. Inflation risk: when prices go up, everyone pays more. But also: it erodes your purchasing power in the long term, meaning you will not be able to buy as much for the same amount of money in the future. So investment returns have to exceed inflation consistently. Reinvestment risk: the inverse of interest rate risk, this is the possibility that if rates fall, you will not be able to reinvest at the same rate you've been earning, and your money will yield a lower return. Again, even if you don't own individual bonds, the companies you own in your portfolio (think banks here) are subject to this risk. Regulatory/political risk: the likelihood that the greater environment in which economies operate shifts suddenly, with new and unforeseen laws and regimes to contend with. Default risk: the risk that the borrower defaults on a debt payment. The US government is considered free of default risk (you will always get your money back when you buy US Treasury securities - the government will simply print more money if they have to!) and for that reason, the interest rate on these securities is used as the basis for pricing everything else. The rate on these represents the possibility of losing money due to all the other factors listed below. It's a misnomer, but this is known as the risk-free rate: really that just means it's free of default risk. Liquidity Risk: the possibility that you won't be able to find a buyer for your asset as quickly as you need. Think of the difference between owning a house, and owning Apple stock. You will have a buyer for your shares as quickly as you make them available for sale, as long as you're content with the current market price: buyers and sellers find each other very easily, the transaction occurs pretty much instantaneously, costs are low, and you get your money quickly. On the other hand, even if you are willing to sell your house for $100, it will probably take a little while to find a buyer (and the transaction will take a long time besides) due to the illiquidity of the market. Thinly traded stocks and alternative investments like commodities and hedge funds are other examples of investments that might take a long time to sell. Management risk: the risk that the leaders of the company won't be able to execute the strategy, will leave, or will underperform in some way. You can certainly imagine some other risks that a particular company or asset runs, that are specific to the circumstances. In addition, you can also imagine that when you hold a lot of the same type of asset, what affects one will affect the rest. And really, if an asset price decreases, there might be a definitive reason and there might not be. Sometimes an asset loses value and we don't know why! But the above list will help you think about the forces at play in your portfolio, and consider the importance of diversification as well as the return you expect to receive for the possibility of losing your money. Last time, I wrote about how to decide whether to make your traditional pre-tax retirement contributions, after-tax Roth contributions, or a combination, as well as how to prioritize saving inside your employer plan, or outside in an IRA. I mentioned that even though Roth IRA contributions are subject to income limits, there is a way for even high earners to get some money in that bucket every year, commonly referred to as making backdoor Roth contributions. It's an important planning technique because Roth IRA savings are so powerful - the tax-free growth AND tax-free distributions AND lenient rules around withdrawals mean everyone should really consider them, regardless of income level. Ensure no pre-tax IRA balances exist. This includes, Traditional, Rollover, SEP and SIMPLE IRAs (but not beneficiary or inherited IRAs) If there are, roll those funds into a qualified plan such as a 401k or 403b. If this isn’t possible, hold off on executing the strategy since it will negate the tax benefits you are trying to capture. Establish, and make a contribution to a Traditional IRA. This contribution will not be deducted on your taxes. You can leave the contribution in cash for now. The next month, convert the balance in the traditional IRA to a Roth IRA. Invest the funds according to your preferred strategy. Ensure no small balances remain in the Traditional IRA. If so, request that your custodian convert those as well. Those who earn too much to make outright Roth contributions. See here for the IRS limits for 2018. If your AGI is below these levels, just contribute directly to the Roth IRA (through the front door) - no need for the extra steps. Spouses make their contributions separately, and their IRAs are not commingled. So if one spouse has a traditional IRA balance with no opportunity to move it to an employer plan for the time being, but the other spouse has a clear path, there's no reason to wait on executing the strategy for spouse 2. The DOL Fiduciary Rule is dead. What now? As was widely anticipated, the Department of Labor's fiduciary rule, or the requirement that advisors act in an investor's best interest when providing advice on retirement accounts, is dead. In March, the Fifth Circuit Court of Appeals struck down the Obama-era law on the grounds that the Department of Labor overstepped their authority in instituting it. In June, the deadline for the decision to be appealed to the Supreme Court passed with the DOL declining to defend the rule. So, where does that leave everyone? I wrote in 2016 about what the new law would mean, and what it wouldn't mean, for individual investors. Because the rule only covered actual retirement accounts (IRAs, 401ks, 403bs and the like), investors would still be on their own to ensure they were being given advice that was based on their best interests at all times, not just in specific situations covered by the rule. Still, it was certainly a step in the right direction. The industry had been in the middle of implementing the rule before the November 2016 election threw its future into doubt. The public has been coming around to the idea of asking for clarity around compensation, and ultimately I think the industry won't entirely abandon some of the changes to compensation models that have already been made. To be sure, a fiduciary standard - or really, any regulation - can't guarantee that an advisor will be honest, or competent. And plenty of brokers do a great job for their clients under a commission model! But what the spirit of rule did was increase transparency and give the client the ability to make an informed decision about how they wanted to be served. Unfortunately, it is still on the consumer to make sure they know how the relationship is being defined: if you want advice that conforms to the fiduciary standard of being in the client's best interests at all times, you have to specifically ask. A fun topic in personal finance of late has been the rise of microinvesting sites. These are services that connect to a bank or credit card account and round up your purchases to the nearest dollar, then invest that difference in one of a range of ETF portfolios. You can make a one-time investment of an amount of your choosing anytime you like, as well as set up recurring investments on a regular monthly or weekly schedule. There are lots of interesting benefits to this and some things to be aware of. It's automatic. There's an undeniable behavioral aspect at work. It all happens in the background. And you don't have to constantly make the decision to transact - that friction "costs" in the sense of you maybe being distracted and not pulling the trigger one day, or you being spooked by a headline and not pulling the trigger one day. You don't really "feel" the pennies leaving your account and it adds up quickly. That's good because it drives home the impact that small changes can have on your long-term view, especially for younger savers. It can be daunting to think about how much money you will have to save for retirement when it's 40 years away. But starting early, being consistent, and staying out of the way has an enormous impact. Seeing the small amounts add up can lead to positive reinforcement where you will want to do more. It's cheap! An obstacle to getting started with investing is that 1) you usually need to have a few hundred dollars, at least, to open an account, and 2) you can incur a per-transaction cost. Microinvesting sites charge you a nominal per-month fee instead of per-transaction charges (and some are completely free). You can even have retirement accounts! This can be a con though. While you can have an IRA on these platforms, I'm not so sure you should. The question of how much you can and should contribute to a tax-advantaged account can be complicated by whether you have access to a retirement plan at work, how much you make, how much your spouse makes, etc. Unless you are very sure about your ability to contribute, I would stick with a regular taxable brokerage account since those are not constrained by anything. Overall, I think these are a pretty useful addition to the personal finance landscape, if they are used correctly: as part of your overall investment strategy, where they are not taking the place of appropriate-for-you retirement contributions. You will almost undoubtedly save more money from automating the process than you would otherwise, the costs are very reasonable and the options can be very good. Just like with any other investment, don't do it if you're not ready to leave the money there for a long time, because ultimately, even the best-laid investment strategy can't outrun an emotional decision. My 8 year old son recently asked me whether we could afford to buy something or do something he wanted. I couldn't really answer him. On the one hand, yes. We could afford it. Objectively, it wasn't a lot of money. We would still keep a roof over our heads, and eat for the next month, if we spent this money. It wouldn't really cause harm. Is that a good metric for whether you can afford it? On the other hand, no. We couldn't. It was a big enough expense that it would have pushed us over our self-imposed spending limit for the month. It wasn't an emergency or anything so important that NOT spending the money would cause harm, either. Is that the right metric? I eventually settled on telling him we couldn't get it yet, but might do it next month*. Which is fine, I guess, and we are trying to teach him that it's okay to wait for things. But I had a weird reaction to the question of whether we could afford something, because it's a concept that is fraught with discomfort. We come up with lots and lots of ways to get around saying that we can't afford something, however we happen to define that for ourselves. Why? Why are we afraid to simply say no we can't, in fact, afford something? With no other explanation given. It should be enough, right? We shouldn't have to equivocate with friends and family and give them a (possibly made-up) reason. Living within your means shouldn't require an explanation, and those closest to us should be glad that we are. And normalizing being clear about your limits and boundaries helps us all and reduces the 'keeping up with the Joneses' effect. It's fine to have other priorities, whether that's paying down debt or living smaller or investing more or anything else. But saying no to things that other people are doing also brings with it the sense that maybe you're judging others for their choices; maybe you are rejecting them, personally; maybe you're just no fun; maybe you are just not living right if you claim you can't afford something - surely you should be able to if everyone else can so what's wrong with you? I think this is one of the barriers that keep us from having a healthy relationship with money. It is one of the ways that we give it too much power. If you're worried about how you're going to pay the credit card bill, but you can't see a way out of having a high credit card bill because you "have to" incur all these expenses you don't really want to incur but you say yes because you can't say no, then your money controls you, rather than you controlling it as a tool to get you where you want to be. It's okay to not consume, it's okay to not give in to the pressure that there always needs to be more, that everything needs to be new all the time, that things equal love and that if you were really a successful grownup you would want all of this too. A lot has happened in just the past few weeks. There isn't a lot of time to do much planning before year-end (and remember, none of the changes will impact the income you have earned this year), but there are two main questions that might be top of mind for you right now: what do I do about withholding for next year, and (this one is especially relevant for my NY clients) should I try to prepay my 2018 taxes if I'm losing the deduction? The first question will be answered in a later post once the IRS issues guidance and HR/payroll departments have had a chance to catch up; your take-home probably won't look that different in the meantime. 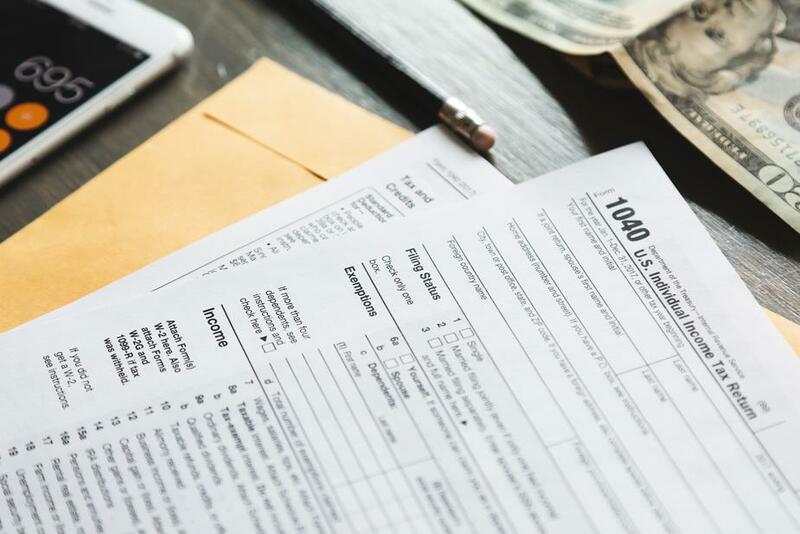 Without going too deep into the guts of the new law, here's a rundown on how the changes to the property and income tax deduction might affect you. Currently (as in, how your 2017 taxes will be filed next year), if you itemize you can deduct the state and local taxes or state sales taxes you paid on line 5 or 6 of the Schedule A. Starting next year, these deductions are limited to a combined total of $10,000. So that leaves many taxpayers in a situation in which they have significant deductions for 2017 that they will lose for 2018; as a result, it makes sense to try to maximize those deductions now to ease the pain of losing them later. The new law disallows deducting prepaid state and local income taxes; it does not, however, mention anything about deducting prepaid property taxes. This is a key point: the agency hasn't specifically said it will allow this deduction, either. So it is possible it could still be disallowed, though it's generally expected to be accepted. 1) Did I itemize in 2017? The standard deduction in 2017 for a married filing jointly couple is $12,600. If you're not sure whether you itemized or claimed the standard deduction, look at line 40 of your 2016 tax return. If you live in a high sales tax area or have a mortgage, you probably itemized because your deductions would have been more than that minimum amount. Unless 2017 saw some big changes for you in terms of income or where you lived (or medical expenses), assume this question will have the same answer in 2017. If you didn't itemize in 2016, you probably won't in 2017 and it's not worth prepaying. If you plan to itemize, continue to #2. 2) Will I itemize in 2018? This is a big change in the incoming tax law: the standard deduction will see a large increase to $24,000 for a married filing jointly couple (this is paired with the elimination of the personal exemption, which for 2017 is $4,050 per person). So unless you have more deductions than this - and remember, you will only be allowed to deduct a maximum of $10,000 in combined state and local taxes - you will probably just take the standard deduction. Again, use your 2016 taxes as a guide and adjust accordingly for big changes. If you won't itemize, it doesn't matter when you pay your taxes. If you think you will itemize, continue to #3. 3) Am I subject to AMT? The Alternative Minimum Tax as we know it dates from the early 80s and was implemented to serve as a parallel tax system to ensure high earning individuals (and corporations and trusts) did not escape taxes by using excess deductions and exclusions. It provides a minimum floor of tax that must be paid. In fact, AMT is calculated for every return; the taxpayer is required to pay the higher of AMT or regular tax. Over time the calculation has gotten out of sync with inflation, however, resulting in lower earners being affected. The law does address this somewhat (though crucially, it temporarily adjusts individual AMT while permanently repealing corporate AMT). Here again, look at your 2016 return, specifically at line 45 on page 2 of the 1040: this will tell you if you owed and paid AMT. Remember, 2017 should be about the same as 2016, unless your particular situation changed. State and local taxes are one of the things that get added back (in other words, they're no longer deducted) for AMT purposes so if you're in AMT range, the extra deduction won't help you. If not, then it may make sense to prepay. 4) But how do I do it?